This article is about russian/Kazakhstan male tennis player Andrey Golubev, who was born in Russia and later changed his nationality to Kazakhstan. Here is given his profile, career and records. His career high ranking in singles is No. 33, which he achieved in year 2010. He also is a winner of International German Open. 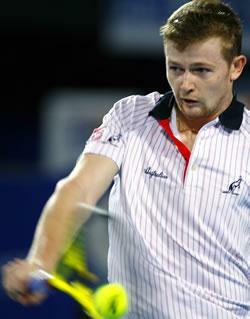 Andrey Golubev is a russian male tennis player. Born in Volzhsky (Russia), but in 2008 he changed his Nationality to Kazakhstan. Andrey started playing professional tennis in 2005. He struggled to make good impression, as most of his inclusion was limited to the Future tournaments and Challenger events. In 2007, he played in Qatar ExxonMobil Open, which was his first ATP tournament. His first Grand Slam tournament was 2008 US Open and advanced to Second round before losing to David Nalbandian. He achieved his career high rank of No. 33 in 2010. Andrey Golubev has won one ATP tournament till now. It was in 2010 International German Open, where he defeated Jurgen Melzer in the final of the event. Before that, he also World No. 6 Nikolay Davydenko, who was also the sefending champion. Except this, he also reached the finals of two other ATP level tournaments. In 2008, he reached the final of the St. Petersburg Open and also played 2010 Malaysian Open final.